In the Williamsburg/Greenpoint section of Brooklyn, New York stands a nondescript inner city public school, Intermediate School 318. Despite its appearance, this is no ordinary school. It houses the highest-ranked junior high chess team in the United States. The team has won more than 30 championships – more than any other school in the nation – by a long shot. It sounds impossible, or at least wildly implausible, that a group of below-the-poverty-line kids would volunteer to stay after school every day to learn chess, no less to become champions and world master level players. Lead by caring and charismatic chess teacher/coach Elizabeth Vicary and with the cooperation and support of assistant principal/coach, John Galvin, who leads a tournament field trip every weekend, the kids at I.S. 318 have succeeded beyond all probability. The appealing and inspiring documentary “Brooklyn Castle,” focuses on five chess team players who work to overcome difficult personal issues and aim for excellence, not only in chess but also in their broader lives. As we follow these players, we root for them to succeed on their own terms. A pensive chess player, 12-year-old Alexis Paredes is the second rated member of the team. He sees chess leading to admission to one to New York City’s high echelon public high schools. From there, he hopes college and a career will allow him to support his immigrant parents. A single stressful exam determines his high school admission. 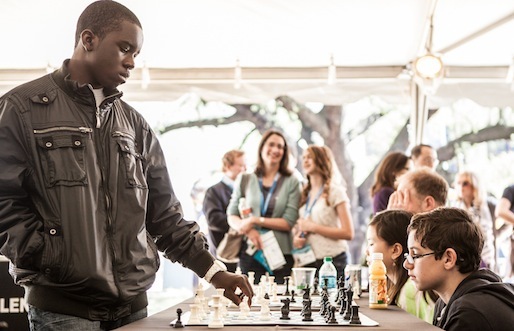 Justus Williams is an 11-year-old celeb in the scholastic chess world. He has been selected to join the U. S. Chess Federation’s honored All-American team – one of the highest national honors achievable by a young chess player. He’s trying to absorb the positive attention as well as the demands of higher expectations. For 11-year-old Patrick Johnston, chess is a way to learn persistence and concentration. Suffering from attention deficit hyperactivity disorder, he has the humble goal of raising his ranking to a middle level. Pobo Efkoro, at 12, is a natural politician and leader who serves as a big brother to other chess team members. He runs a sophisticated campaign to become president of the school, with the goal of restoring budget cuts that threaten I.S. 318’s chess and other afterschool programs. We may see his clips of “Brooklyn Castle” when Pobo runs for political office twenty years from now. Three years after Rochelle Ballantyne joined the chess team, she became the highest-rated player at the school, with the potential to become the first African-American female Chess Master. Now moving on to high school, she is uncertain whether she can combine high academic achievement with a serious commitment to chess. Director Katie Dellamaggiore spent many hours getting to know the chess team so that they would be comfortable and natural during the filming of “Brooklyn Castle.” The shooting began without a clear focus or ending in mind, enabling the film to unfold during the school year as budget cuts and Pobo’s presidential bid surfaced. In April of 2012, I.S. 318 became first junior high school chess team to become, not junior high, but High School National Champions. The team was honored in a ceremony lead by New York City Mayor Michael Bloomberg and lauded on the front page of The New York Times. The award-winning “Brooklyn Castle” tells a powerful and positive story about dedicated teachers helping kids succeed no matter what their circumstances. It’s illuminating and optimistic. I recommend it highly. Emily S. Mendel, a writer and photographer, has been a regular contributor to culturevulture.net since 2006, where she reviews theater, art, film, television and destinations. Ending her 30-year law practice has given Ms. Mendel the time to indulge in her love of travel and the arts, and to serve as the theater reviewer for berkeleyside.com.